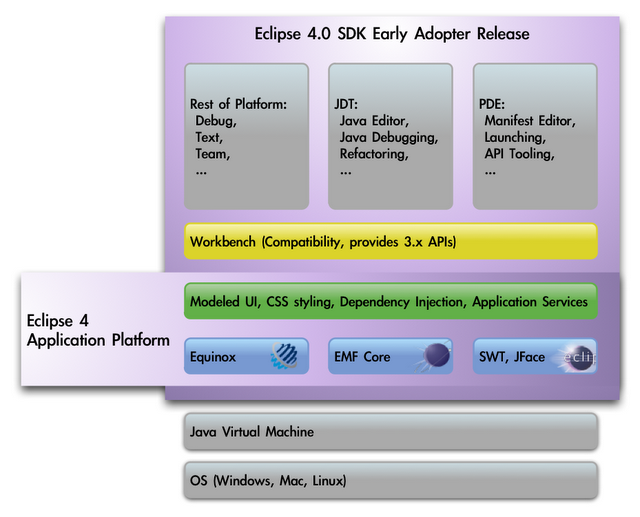 The Eclipse Foundation has announced the official availability ofversion 4 of Eclipse SDK. With this new generation of the Eclipse development environment, the Eclipse developers are aiming to modernise the IDE's underlying architecture to include contemporary features such as a model-based user interface framework, CSS-based declarative styling of the UI and a services oriented programming model for consuming Eclipse provided services. A more modern look and feel for the workbench has also been incorporated along with binary API compatibility with previous releases to make migration simpler. Eclipse 4.0 SDK is more of a new version than a replacement for the current Eclipse 3.x development strand. The Eclipse Foundation, in its announcement of the release, say it is aimed at early adopters and plug-in or Eclipse RCP (Rich Client Platform) developers. The foundation says that users of tools such as the Eclipse Java Development Tools (JDT) or the Eclipse Web Tools are not expected to see much benefit from moving to Eclipse 4 yet. Before the wider audience of developers will see any major improvements the various users tools and plug-ins will need to be migrated to Eclipse 4 to be able to make use of the new features.